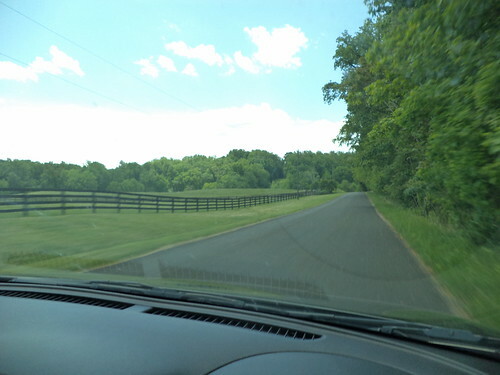 Carole and Larry live off a highway south of Warrenton, Virginia. On Friday, Carole and I had to run errands. 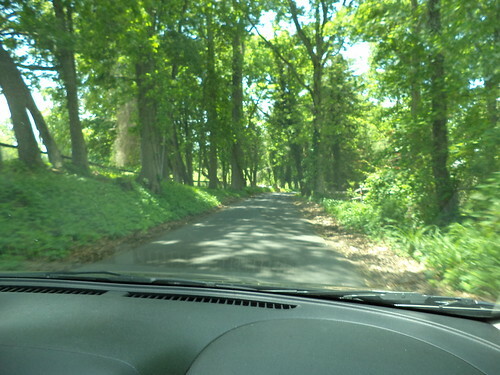 We took the rental car and drove around so I could have some sense of the land where they live. First of all, it's green. There are a lot of trees and pasture in this area. Horse farms too. 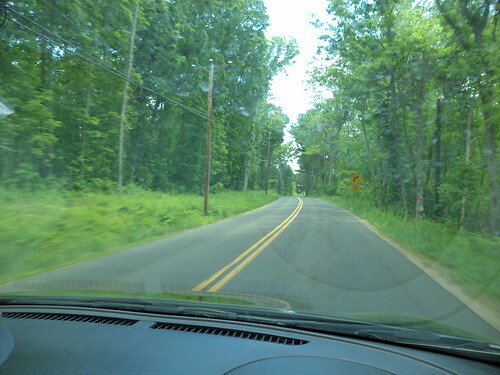 Ironically, when mom and I were out here in 2011, we turned onto the very road Carole and Larry now live on and drove it quite a ways before turning around because at that time, we weren't going the right way. That's the part that is very interesting to me. 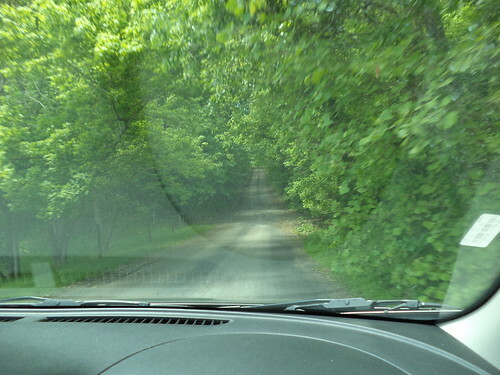 There are some straight stretches, but the road is quite curvy. 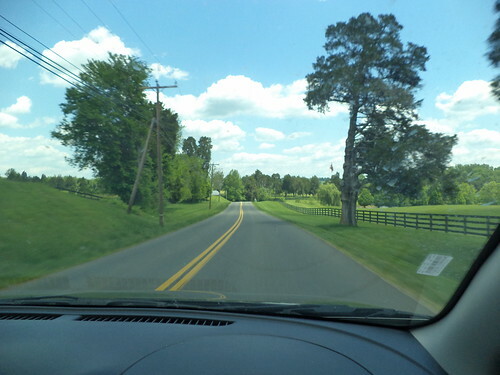 Trees and telephone poles are right on top of the road and if you're looking for a ditch, well, some places have one and some places don't. I've remarked on history before. I can sometimes think of "history" as starting with the early settlers of the Midwest. Although the area had been scouted by Father Marquette, real settlement didn't come until the early 19th century. Lewis and Clark didn't find large settlements when they headed west. Chicago was still draining the swamp. I take for granted that if I take Country Road Y54 to the north, it will, at some point, intersect with Highway 151 which runs on a diagonal from Cedar Rapids to Dubuque. Getting "there" from "here" in Iowa won't get you totally lost. In Virginia, all bets are off. We came to an intersection and Carole said, "I've never been this way. Let's see where it goes." It went past more horse farms and stone walls which mark perimeters of homesteads which have been around for nearly 300 years. That's the part that is fascinating. (It's something we forget when we walk on European soil and see places where people have lived for millennia.) Warrenton was settled around the time of the War of 1812. Many places in Virginia were settled far earlier than that. People needed to get from point a to point b and they created the first roads by repeatedly driving a route someone had found. That route has never been substantially changed, although Interstates and more heavily traveled roads are straight. 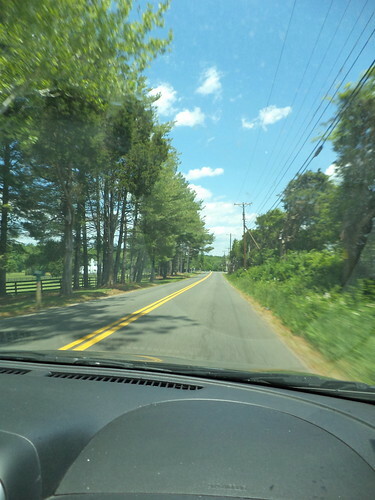 The roads we poked around on on Friday were not and were not as wide as we expected. 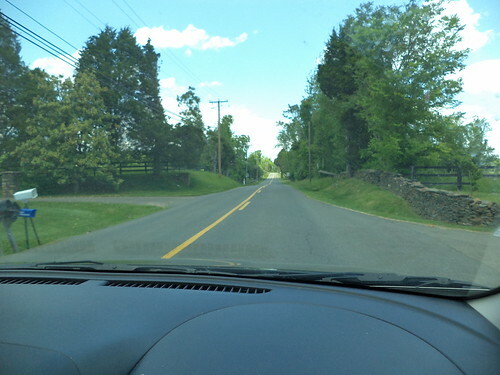 The idea of a grid system to roads and town design wasn't used in Virginia. You need to go from here to there, you hopped into the buggy and headed that way. So the roads we drove on date from around the War of 1812; buggy tracks which were gradually improved, eventually blacktopped, but make them wider than a car and a half? Not likely. 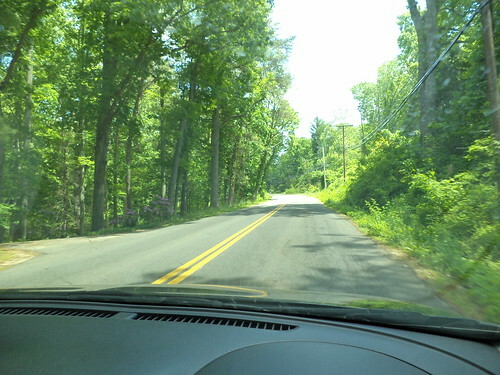 In fact, our road went from the above blacktop, one and a half car widths wide to a two track asphalt drive. Although covered with asphalt and looking reasonably sturdy, we decided this would be as far as our "where does this go" would take us on that day. 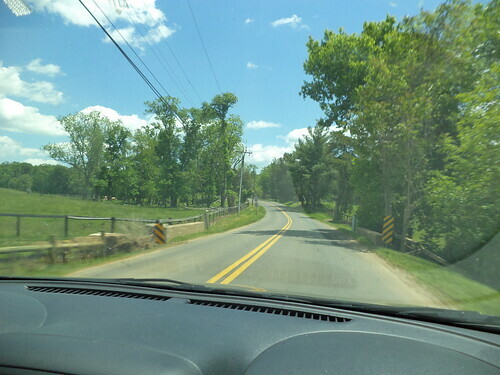 I imagine soldiers of the Civil War trudging along these roads. They would have been unimproved and prone to flooding and mud when it rained. Macadam road construction, developed by a Scotsman, hadn't reached all public roads and that made a lot of them, little more than wheel packed dirt, quagmires when wet. It was a fascinating drive. I kind of want to know where this goes.